While the nation was deep into the Great Depression, one Chesterton man's entrepreneurial spirit likely had a positive economic impact on Porter County. At the very least, he provided low-cost entertainment to tens of thousands of individuals at a time of relative economic misery. In 1933, as a way to supplement their income, William Murray and his son-in-law, Harry Koch, began building scale buildings that were targeted toward use in rock gardens. 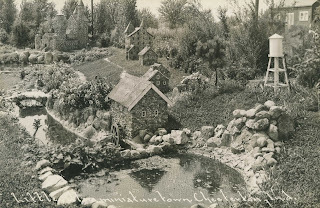 It seems that during the Depression that rock gardening became sort of a "craze" across many locations in the United States, as newspapers of the time are replete with advertisements for the construction of rock gardens and the plants to include in them. Panoramic postcard image of Littleville, a miniature town in Chesterton, Indiana. 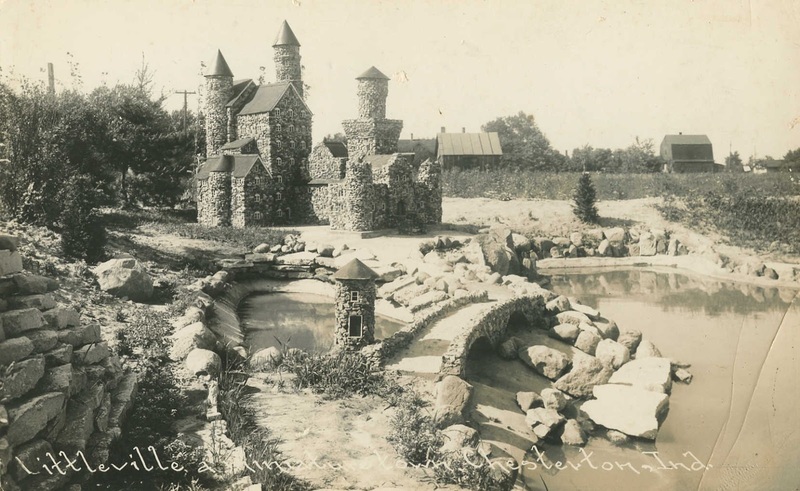 Evidence suggests that Murray and Koch initially sold their small buildings from Art Brocksmith's Rock Garden Inn and filling station north of Chesterton. Brocksmith also included some of the miniature buildings at his inn as a way to potentially attract customers. Note that at least two sources place Rock Garden Inn on U.S. Route 12, which is incorrect, as the inn was located at the intersection of present day Wagner Road and U.S. Route 20. Oddly, local newspaper classified advertisements indicate that brooder pigs and heifer cows were also sold from the inn, perhaps from an adjacent farm. 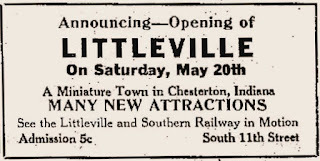 Advertisement announcing season opening of Littleville in 1939. Source: The Vidette-Messenger, May 19, 1939, p. 6. 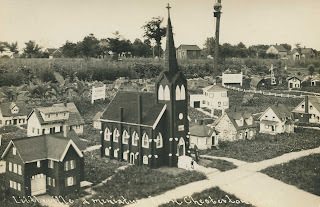 Murray conceived the idea of constructing a miniature town in 1935, complete with a business district, houses of worship, and a residential section. Murray would use his own backyard, located on west side of 11th Street, three block south of Broadway, and consisting of four lots, to develop a rock garden and lay out his town. His home, at this time, was considered to be on the "outskirts" of Chesterton. 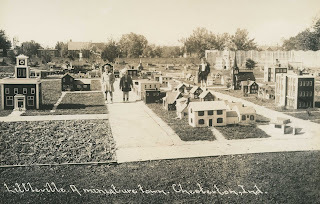 Murray began to lay out a miniature town in his backyard in 1937. 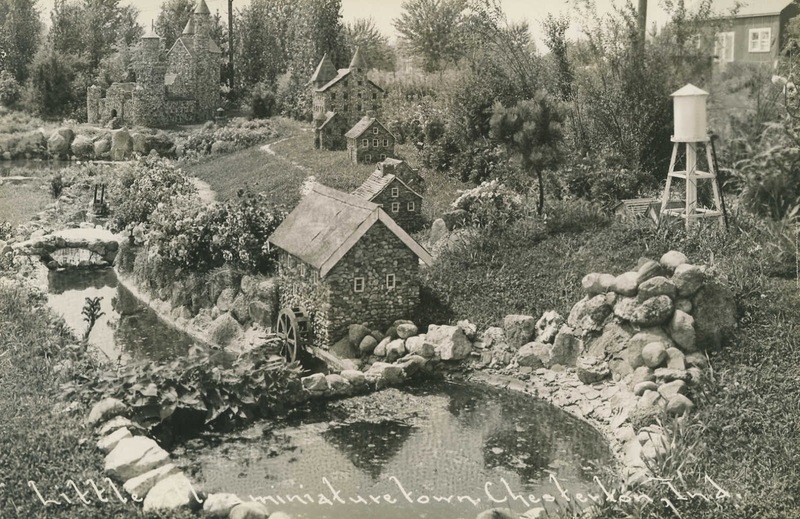 By the fall of this year, Murray and his son-in-law Harry had built numerous buildings for the miniature community. 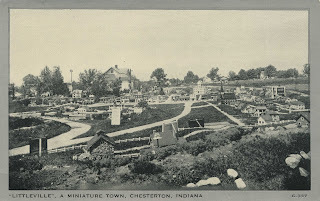 By 1938, Murray's tiny town was becoming a significant tourist attraction; nearly 20,000 people had visited Chesterton to inspect the town within a town. Visitors came from all fifty states, Canada, England, Austria, and Japan. the Bavarian Neuschwanstein Castle in Germany is visible in the background. the Bavarian Neuschwanstein Castle in Germany. basis for the design of William Murray's Littleville castle. At its peak, drawing more than 50,000 visitors in a year, Murray's Littleville consisted of 125 buildings, as well as streets, airport, boats, parks, farms, and pastures (with cows). Some building were wired with audio devices and electric lights. 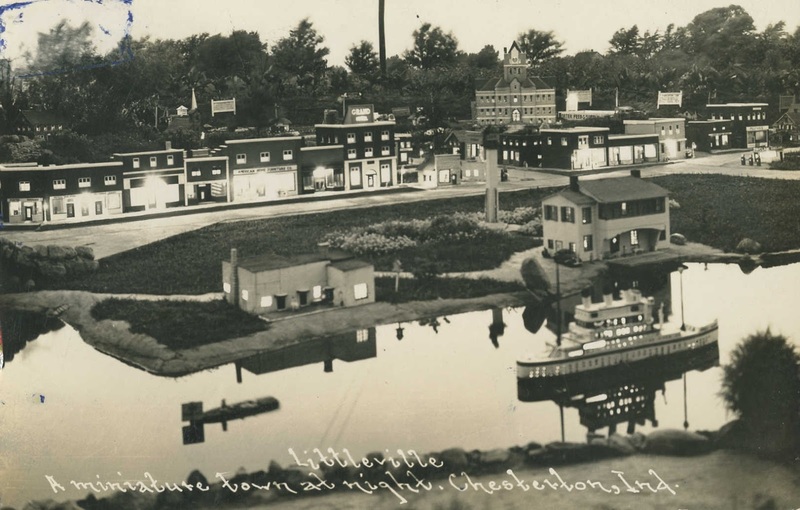 Littleville was not constructed to be a replica of Chesterton, rather the structures were based on Murray's and Koch's memories of buildings where they had once lived and, perhaps, places they had visited or seen in books and photographs. 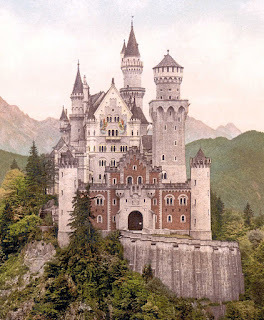 A castle on the property, for instance represented the Bavarian Neuschwanstein Castle in Germany. 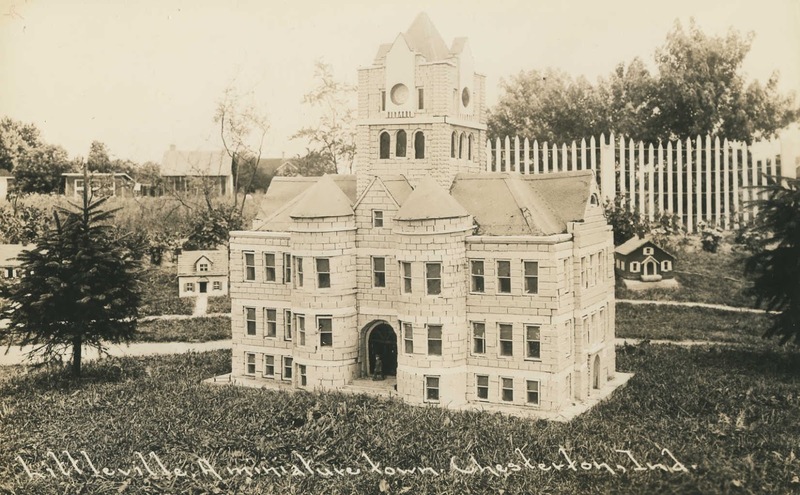 The county courthouse of Littleville, built by Koch, was a replica of the Cerro Gordo County courthouse located in Mason City, Iowa. 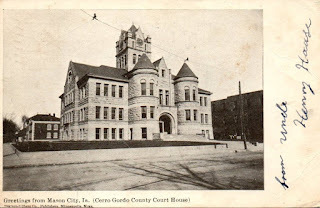 constructed as a replica of the courthouse of Cerro Gordo County, Iowa. Postcard image of courthouse of Cerro Gordo County, Iowa, 1906. Littleville courthouse; the real courthouse was razed in 1962. 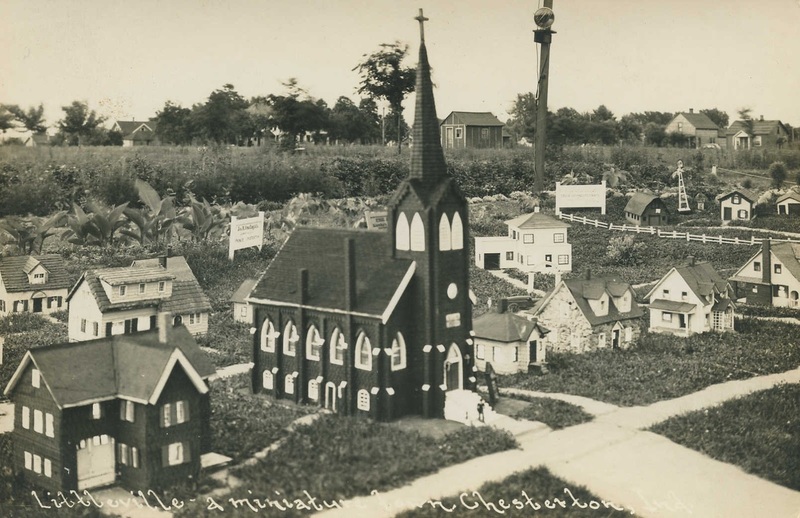 One structure in Littleville, a brick Gothic Revival church with a towering steeple, was a replica of a building located in Chesterton that still stands. 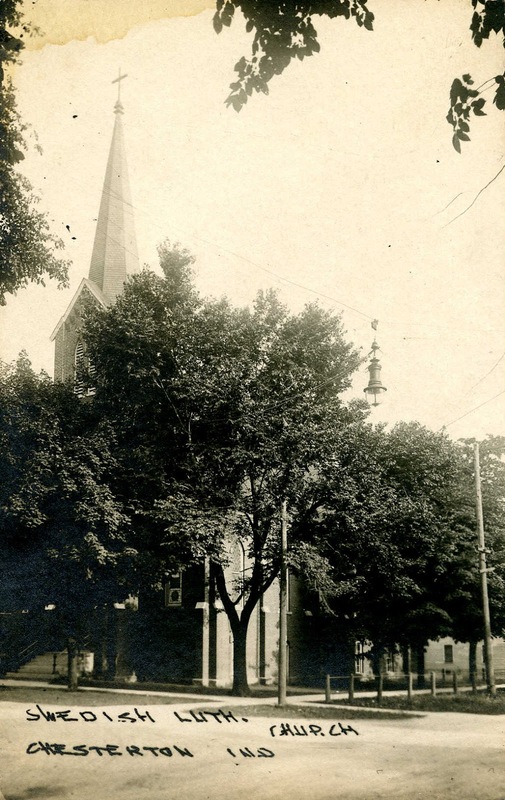 Specifically, the church, built by Harry Koch, was designed after Bethlehem Lutheran Church, located nine blocks directly east of Littleville at the southeast intersection of 2nd Street and Lincoln Avenue. William Murray attended this church. Bethlehem Lutheran Church, also referred to as the Swedish Lutheran Church, broke away from Augsburg Swedish Lutheran Church in Porter, Indiana, as a growing Swedish population formed south of Porter. The church was constructed in 1879.
constructed as a replica of Bethlehem Lutheran Church in Chesterton, Indiana. Harry Koch, was based on the design of this church. Littleville's church had several remarkable features for its time. Reportedly taking 309 hours to construct, Koch included a "singing tower" that played music daily at noon and 6:00 pm, except on Sunday. Koch also built a scale ocean liner that he named Empress of Lilliput. Rigged to this vessel was an amplifier that played orchestral pieces for those tiny passengers that desired to dance on the ship's deck. installed in buildings and the ocean liner. The unique nature of Littleville as a tourist attraction generated national attention. Short films were produced by Paramount Pictures and Scientific Films. 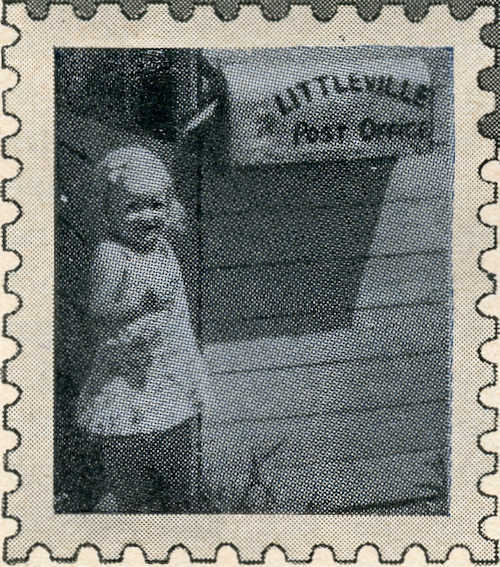 Newspapers across the United States included topical, human interest stories concerning Littleville. The "World's Biggest Little Village" was featured in Popular Science and Popular Mechanics. on the right is a Popular Mechanics illustrated feature published in 1939. It's doubtful that Murray and Koch earned much of a profit with their tourist attraction. The entrance fee was a modest 5 cents. 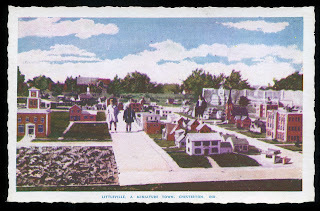 A gift shop operated adjacent to Littleville where Murray sold small do-it-yourself scale buildings, completed buildings, and postcards. The building were intended to be used in rock gardens. Murray also sold copies of Littleville News for two cents, and allowed visitors to send mail from his Littleville Post Office, though it was an unofficial post office and the mail was directed to the Chesterton post office. Funds earned were reportedly reinvested into the maintenance and growth of Littleville. Youngster sending mail via the Littleville Post Office. Murray also purchased a $2,000 insurance policy on his investment. Using the policy as a promotional tool, Murray once commented that Littleville was "the only city in the US covered by insurance from just one company." Like many enterprises, Littleville was negatively affected by America's entrance into World War II. Murray closed Littleville in 1942, explaining that it was "because of emergencies existing at present, the war and especially the rubber shortage." It never reopened. Total visitors over Littleville's short lifespan has been estimated to be 133,000. Chesterton locals Phyllis, Sally, and John Canright. As with any exposed structure, time and weathering took a heavy toll on Littleville. Murray sold some of his buildings, gave others away, and left some intact as Littleville became an abandoned ghost town. His town lots were sold and post-war homes were built where Littleville once thrived. The last building to remain onsite was the Murray's enormous Bavarian Neuschwanstein Castle. After several decades of deterioration, however, the property owners on which the castle was located removed it in 2009. 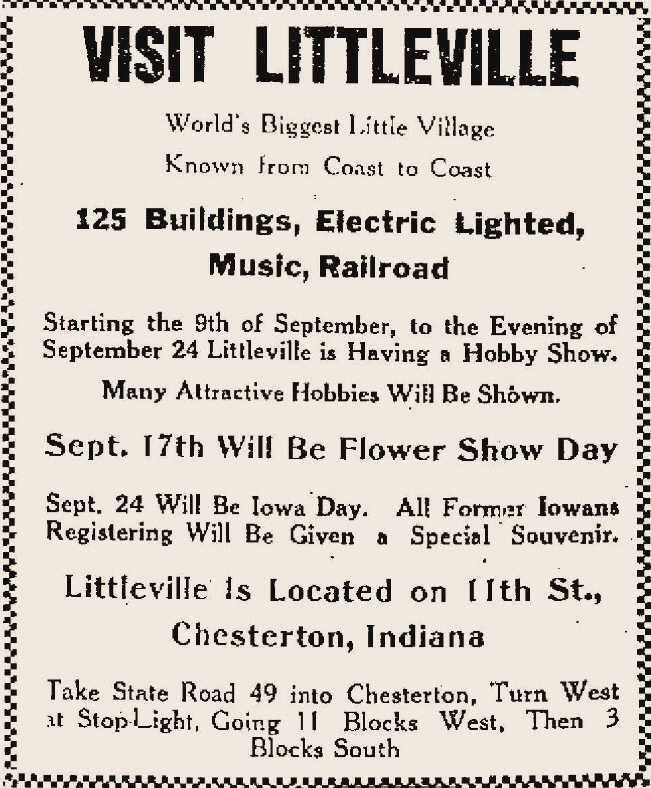 Advertisement announcing upcoming events at Littleville in 1939. Source: The Vidette-Messenger, September 9, 1939, p. 8. So who was William Murray? Murray was born January 12, 1892, at Norristown, Montgomery County, Pennsylvania. He married Margaret Skow, and to this union four children were born: Ruth, Robert, James, and John. Ruth married Harry Koch, who assisted in the development of Littleville with William. Ruth and Harry divorced in 1942, the same year Littleville discontinued operation. Perhaps the stress of the dissolution of his daughter's marriage to his business partner contributed to Murray's closing of Littleville? 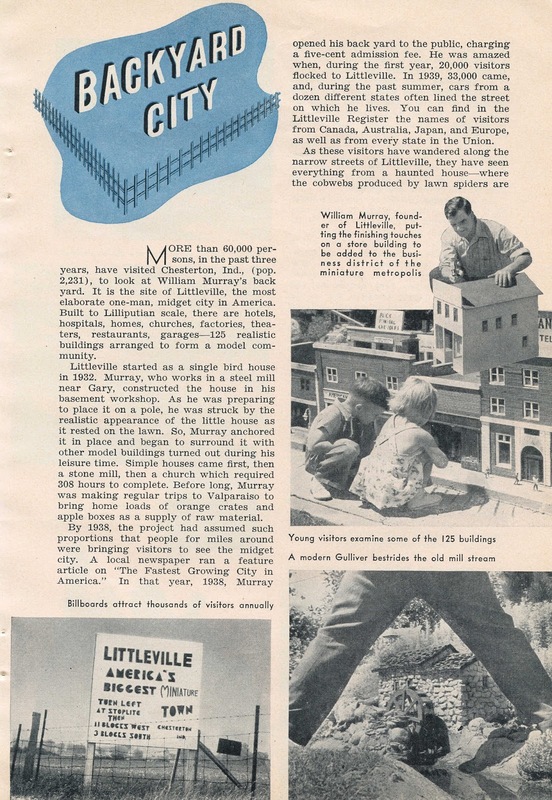 Murray reportedly continued his scale building hobby after shuttering Littleville and also into his retirement years. After his wife passed away in 1961, William moved to Michigan City to be closer to his sons. He passed away on October 16, 1969, while traveling in Dubuque, Dubuque County, Iowa, and was interred in Chesterton Cemetery. His daughter preceded him in death, but surviving him were three sons, thirteen grandchildren, and 20 great-grandchildren. One has to wonder what Littleville could have become had William Murray not started his tourist attraction during the Depression, only to have his rather successful venture stopped cold in its tracks due to the material needs of World War II? 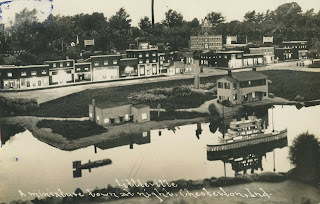 There have been other scale towns constructed throughout the United States, some that still exist, but none quite as detailed and successful as that of Littleville. In fact, some appear to have been started soon after Murray began capitalizing on Littleville, perhaps by visitors who thought that they, too, could develop a tourist attraction in their hometown. 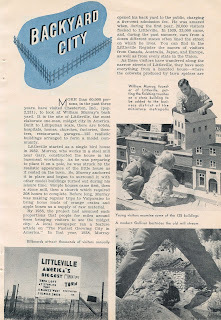 Or perhaps Murray got the idea for Littleville from learning about Tiny Town, located in Morrison, Jefferson County, Colorado? 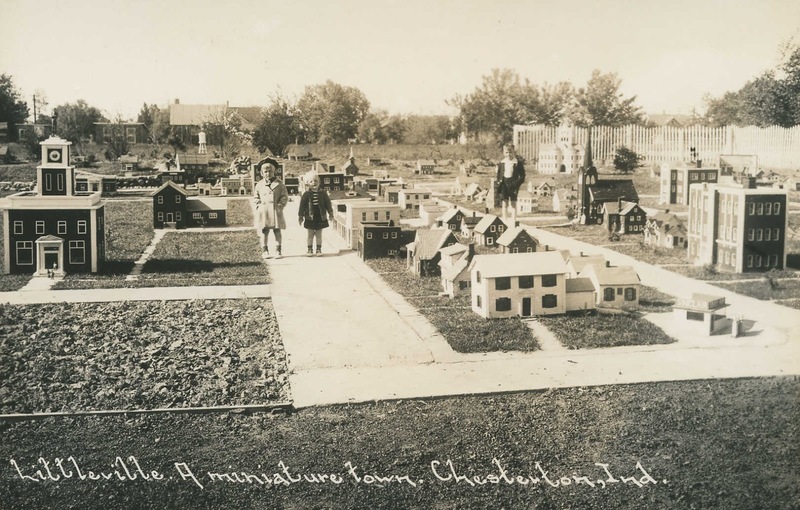 Tiny Town celebrated its centennial anniversary this year  and was originally referred to as Turnerville; George Turner, who constructed the scale town to entertain his daughter, built over 125 structures. 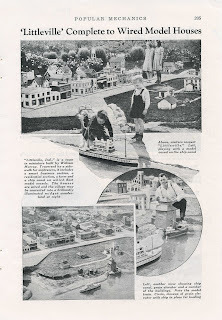 Today one can visit Tiny Town and also be entertained by a functional scale railroad. Anonymous. 1939. 'Littleville' Complete to Wired Model Houses. Popular Mechanics 72(2):205. Anonymous. 1941. Backyard City. Popular Science 138(2):113-114. McHugh, Paula. 2004. 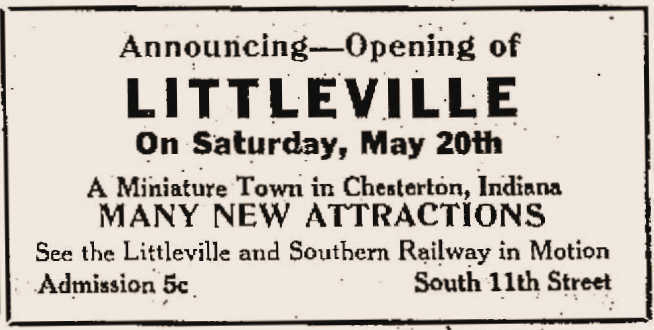 Littleville Attracted Thousands to Chesterton. The Beacher 20(12):1-4. The Vidette-Messenger, Valparaiso, Porter County, Indiana; May 19, 1939; Volume 12, Page 6, Columns 7-8. The Vidette-Messenger, Valparaiso, Porter County, Indiana; September 9, 1939; Volume 13, Page 8, Columns 3-4. The Hammond Times, Hammond, Lake County, Indiana; July 19, 1939; Volume 34, Number 27, Page 5, Columns 2-5. Column titled "Thousands Visit Littleville." The Culver Citizen, Culver, Marshall County, Indiana; August 6, 1941; Volume 48, Number 19, Page 16, Column 3. Column titled "Hoosier Hobby Develops Nation-Wide Attraction." Chesterton Tribune, Chesterton, Porter County, Indiana; October 17, 1969. Obituary titled "Wlliam [Sic] Murray Dies; Created Littleville Here." The Times, Munster, Lake County, Indiana; October 14, 2009. Column titled "Landmarks Erased and Replaced" by Philip Potempa. Chesterton Tribune, Chesterton, Porter County, Indiana; August 20, 2010. Column titled "'Lost Tourist Attractions of the Dunes' Exhibit Extending Its Stay Here" by Jeff Schultz. Hi I am doing an important project for my school over Littleville and I wanted to know if you would be able to give me and more information on this subject please. Ok thankyou and I also wanted to know if you knew about how like Littleville impacted us today by any chance? 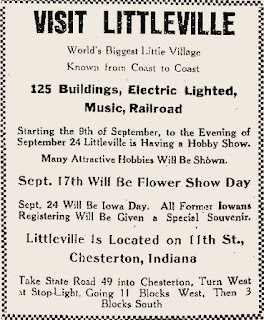 There's little connection today with Littleville in the community of Chesterton. 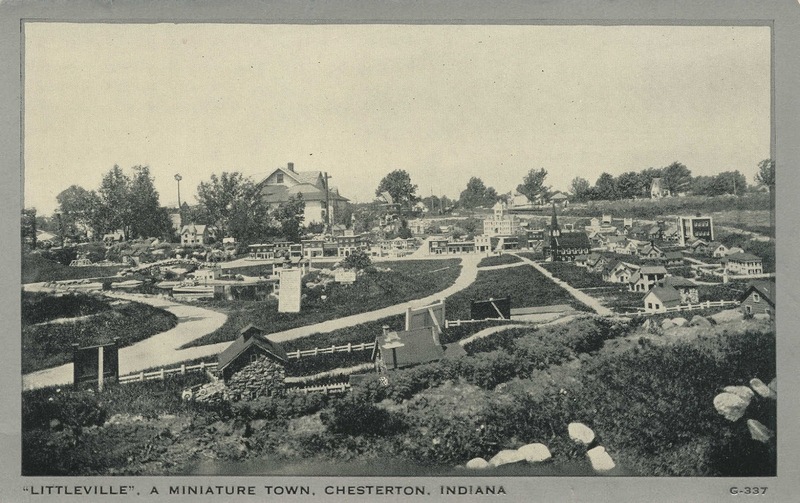 There are many individuals that remember the miniature village, but it has not impacted the community in any great way today. Yes that would be so helpful like to know the connection between the past of littleville and today. Ohh ok I understand, so by any chance have you ever gone to Littleville when you where younger or so becuase I wanted to know if maybe you could tell us anything interesting that you found by any chance. My friend Mey Ting Bobadilla emailed you so if maybe you can share something in the email please!? ?